Remember me? I hope so! Apologies for the brief hiatus. We had a lovely 10 days at home for the holidays and Daily Candy brought tons of new subscribers and orders that kept me plenty busy straight through the New Year. 80 new Stationery Subscribers for January! Mercier Beaucoup is growing fast and furious and it’s mostly exciting, mildly terrifying, and sometimes overwhelming. Oh, and did I mention that I’m getting married in two months? Hehe…. all seems to be under control for the time being, thanks to lots of help from family and friends and an excellent partnership with my husband-to-be. Thought I would share with you some things I am loving right now to kick off 2012! Kate Spade Borough Coasters – a holiday gift from my sis! Frida’s new dog sweater appropriate for a January without snow! 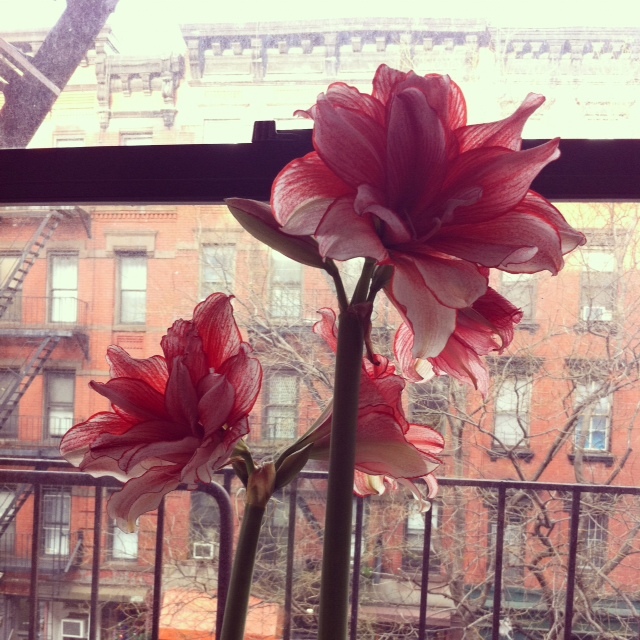 Our amaryllis continues to grow and bloom! Look what we came home to! My very own Aztec Nails painting by Zebber, herself! Get your press-ons here! Dreaming about our honeymoon to Costa Rica! Feels good to be back! Happy 2012 everyone, and lots more to come soon! Ohnmy goodness those coasters are too good…. And those nails! And those noodles! This all looks just delightful. Happy New Year!